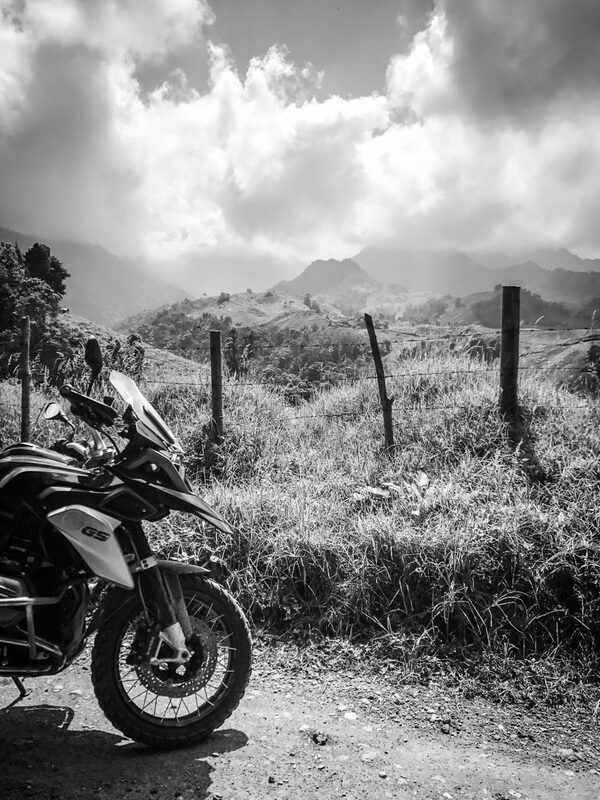 This is the second piece of our Colombian motorcycle journey; if you’ve yet to read part one, check out about the beginnings of the trip here. 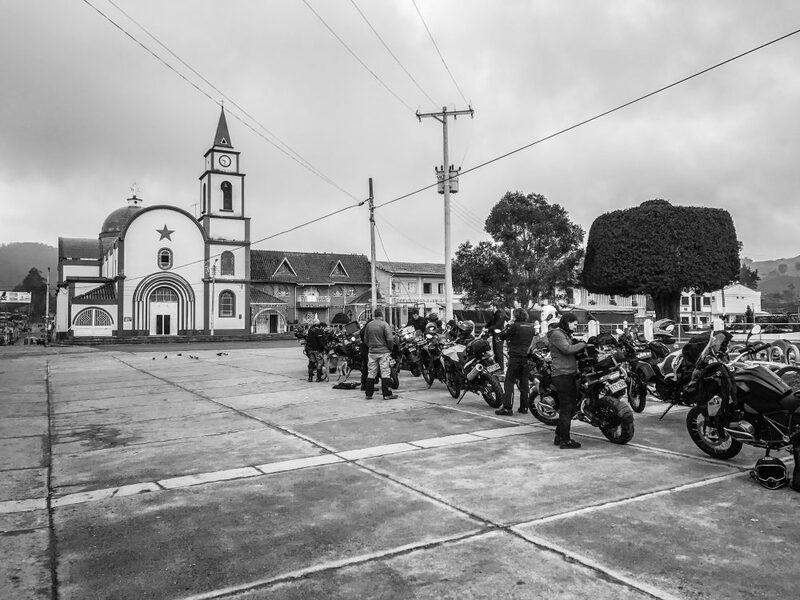 We continued our trip with an arrival in the small town of Murillo on the border of Colombia’s Parque Nacional Natural Los Nevados, where we stopped to tie down any loose gear and do some last minute bike checks. Little did we know that what lay ahead would be the most challenging segment of the trip, and for many in the group, some of the most technical riding they had ever experienced. Turning off the last remnants of pavement, we pressed on up a road of dirt and gravel, taking care to avoid increasingly larger and deeper potholes: we’d be gaining 10,000 feet of elevation as we ascended the mountain side. 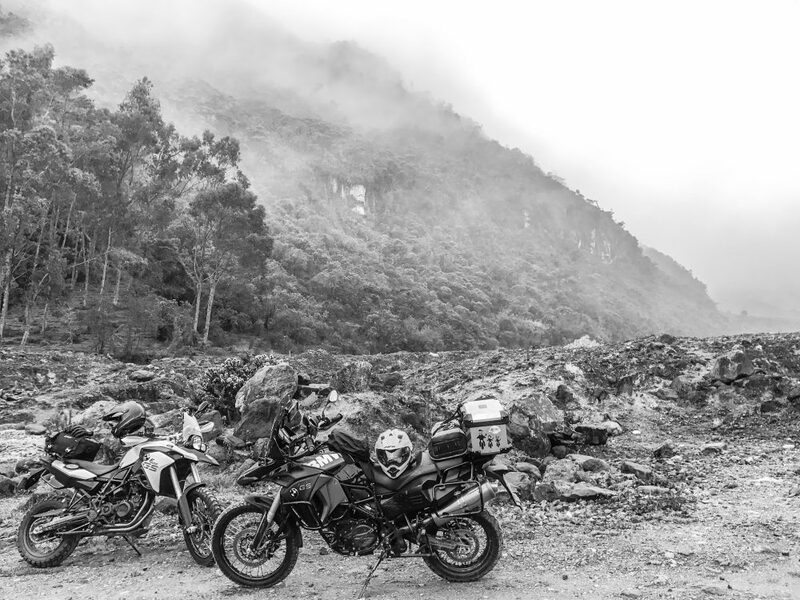 About 40 minutes in, we ended up towards the back of the pack, feeling out the handling of the heavier BMW GS1200 over the varied terrain, and taking precaution to not drop the bike as we were two-up. Some of the potholes and ruts were unavoidable at times, so we had work to do. There was only one way to go, and that was forward. 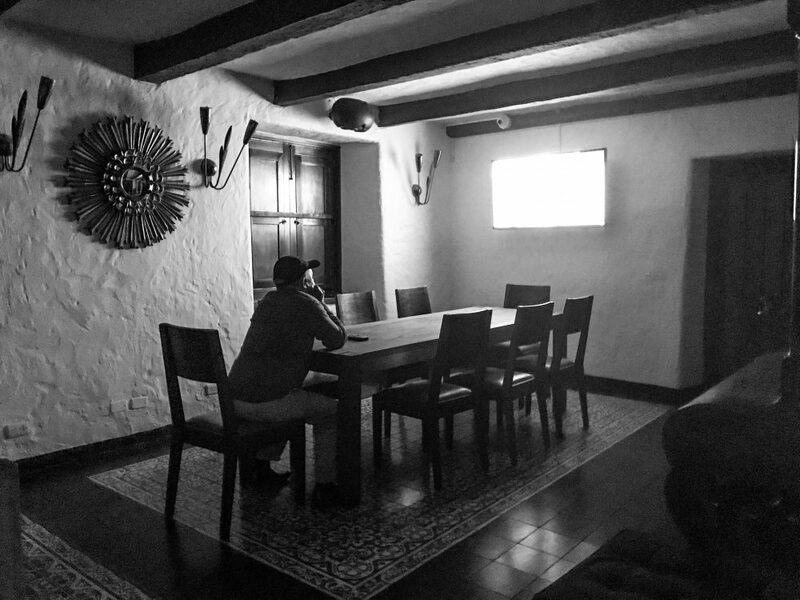 We had to make it to our destination, Hotel Termales del Ruiz. What transpired over the next several hours was our version of an epic saga. Without a doubt, we felt we had been given a gift, experiencing this magical landscape—though there usually comes risk with reward. 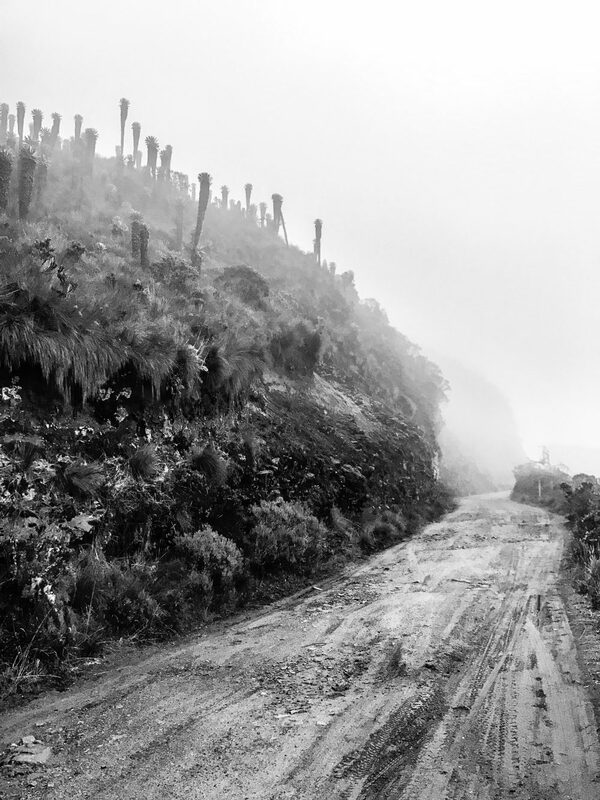 We were conquering challenging, rough roads, covered with smooth stones the size of softballs. 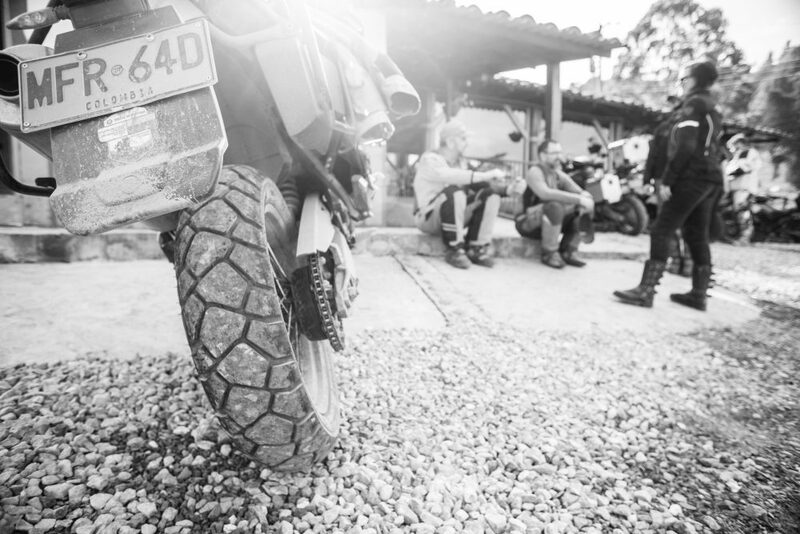 Every so often, the front or rear tire would suddenly sway out from beneath us as it skipped and slid over the rocks. 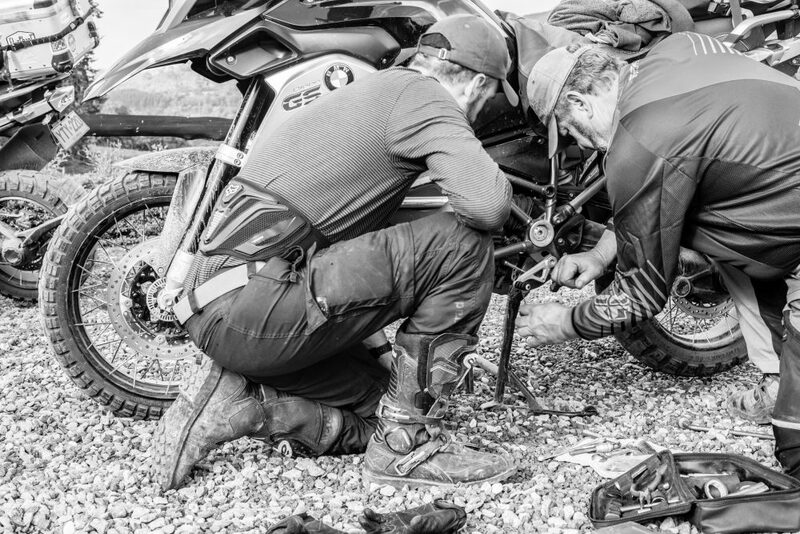 However, it quickly became clear to us why the GS1200 is such a go-to within the ADV bike realm—the electronic suspension and handling were impressive. As we climbed higher and higher, we entered the clouds above the peaks. We now faced negotiating the technical roads in a dense fog that for most of the time only allowed as little as 10–15 feet of visibility. 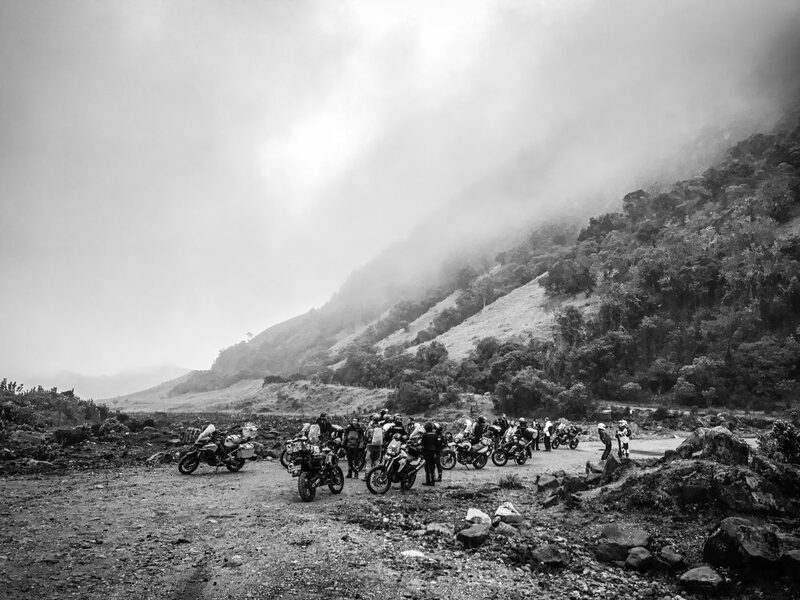 We precariously rode along steep unprotected cliff sides that seemed to drop into unending ravines, but in a way, we were grateful that the fog cloaked the views of the drops we skirted, leaving us only to focus on picking our line ahead. With the lack of roadsigns, and therefore no mileage to keep track of on our odometer, it was almost like the measurement of time had faded away since we entered this mystical place. It had been some time since we had seen anyone else on the road, and we realized we were essentially alone for this stretch. We had no idea when the end or our friends would be in sight, we just kept riding. 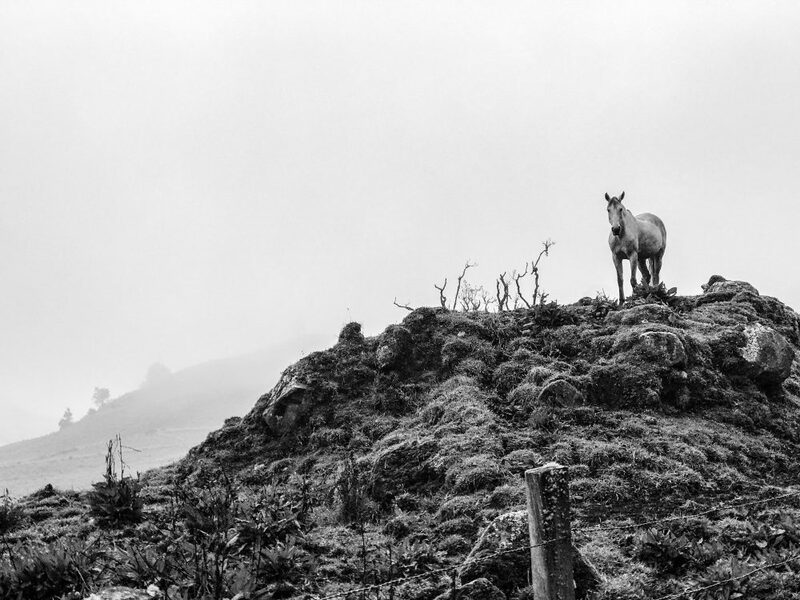 Unexpectedly, along with the fog we were also met with the surreal sight of a beautiful white horse that towered above on a grassy hilltop. As night gradually began to fall, things began to feel even eerier. 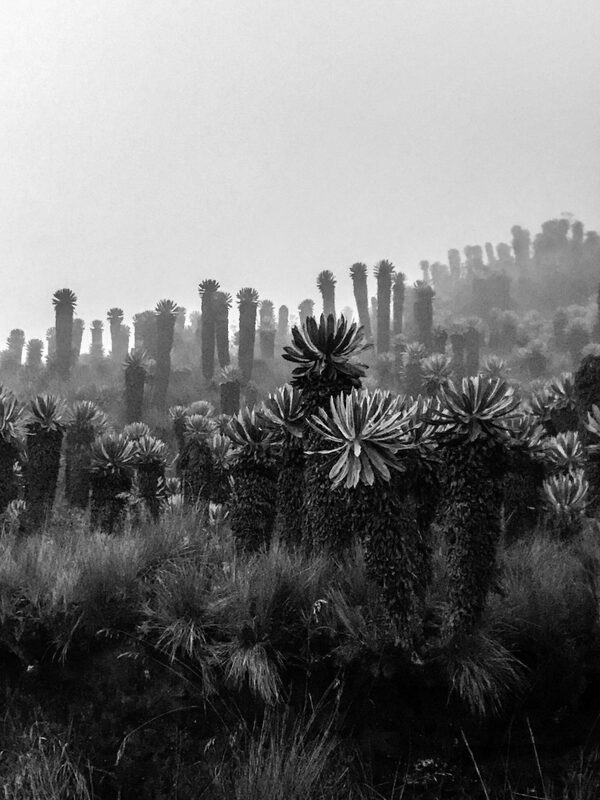 Surrounding us on our left and right were creepy trees called frailejónes which reminded us of something seen in Dr. Seuss books; their narrow stalks (much like palms) give way to a head of bushy, furry leaves at the top. Thousands of them marked the hillsides and we couldn’t help but think they had an ominous quality, like thousands of people watching us as we rode by. 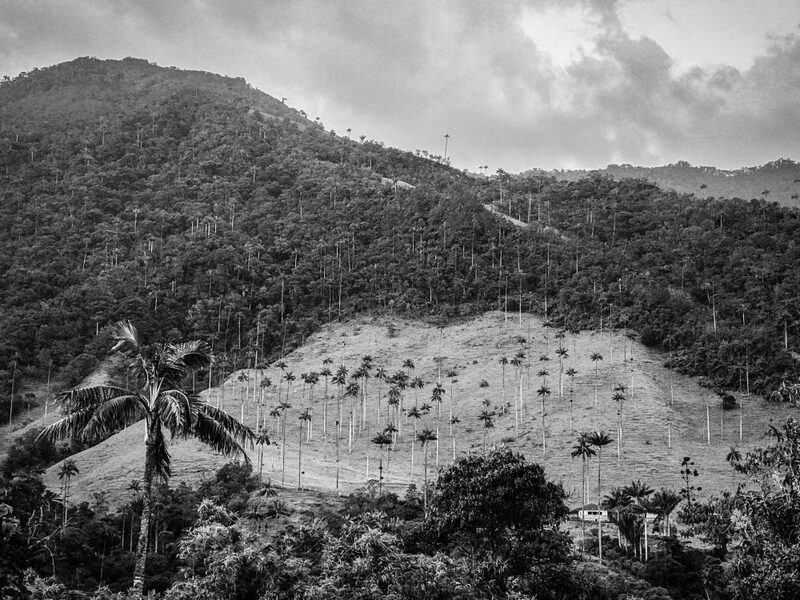 Later, we found out their name, frailejón, means friar, as Colombians believe these trees resemble hooded monks. With the light of the setting sun behind the silhouetted mountains, we were left only with the single bright BMW HID headlight beam to light our way, and at times reflect back at us from the fog. The vast peaks and valleys around us became pits of darkness off an unmarked edge. 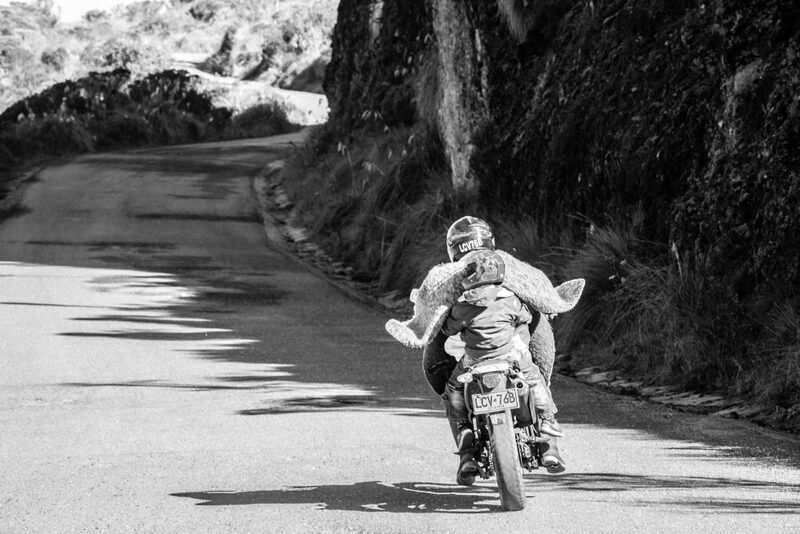 We hoped the rest of our crew was faring alright—we later found out their experience was much different, riding this road sans passenger on smaller bikes was a blast! After what seemed like hours under the night sky, we started to see a grouping of red taillights ahead in the distance! Finally, we reached some of our crew who had pulled over to wait for stragglers (that would be us). The hotel was now only a mere 20 minutes away, so some stayed behind to make sure the last of the group arrived, and the rest of us moved on. 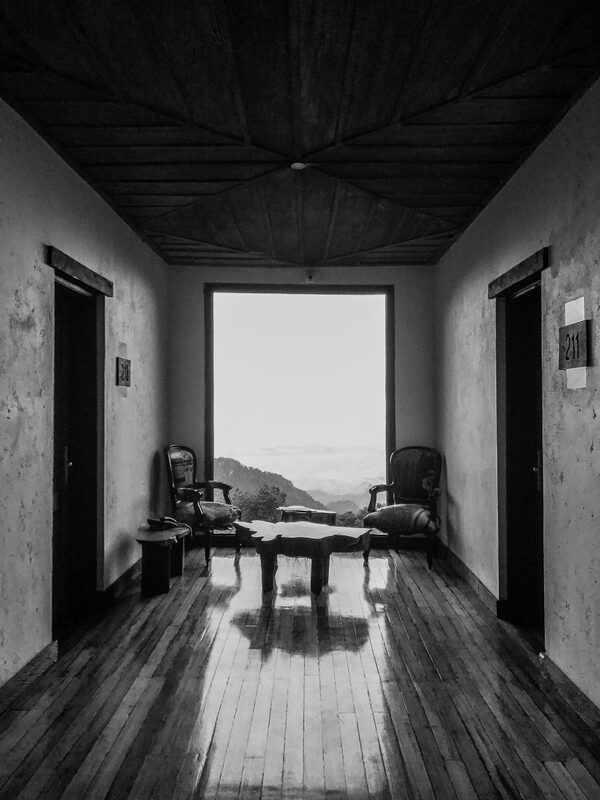 Twinkling in the darkness were the lights of the inn, and we arrived at Hotel Termales with the utmost relief. The beautiful hotel was warm and inviting, and we’re pretty sure we weren’t the only ones tempted to jump straight into the large thermal pool, motorcycle gear and all. After a good hot meal, accompanied by some Club Colombia beers and a few celebratory shots of Aguardiente (Colombia’s own anise-based spirit water), we all soaked in the hot springs amidst laughter and war stories from the day’s adventures. Eventually the exhaustion caught up with us, and one by one we retired to our beds with anticipation of an earned rest. We’d have to be kickstands up at 7am the next day. At daybreak we rose with the sun and enjoyed a nice breakfast of arepas, queso, huevos and of course, coffee. The skies were clear blue without a cloud in sight and we could see out over the mountains all that we were unable discern the night before on our trek in. What had been shrouded in mystery was now unveiled—our surroundings revealed to us the incredible natural beauty of this park, and along with it came the realization of truly how high up we were. We decided to ride up to see the views that we had missed on the way in from an even better vantage point. It was then that we could see the towering volcano Ruiz we had heard so much about, billowing smoke and all. 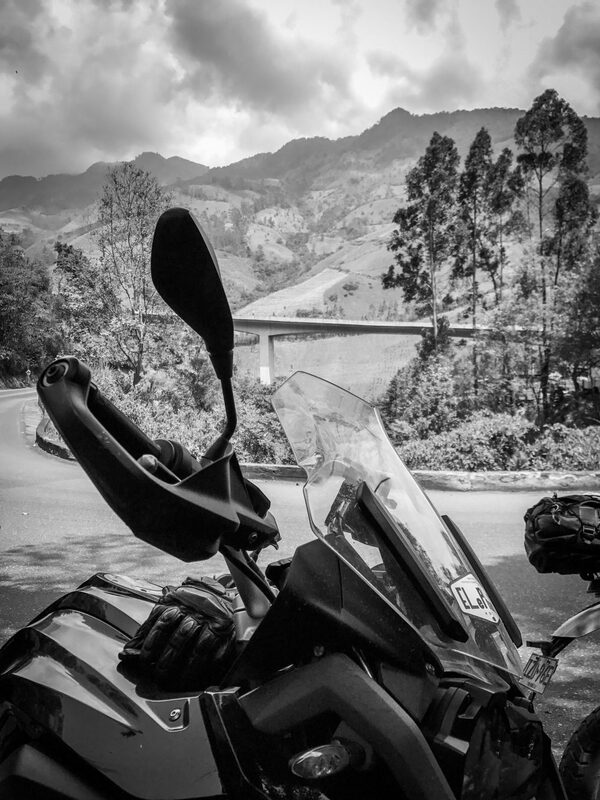 This day’s route would begin with a non-stop 6,000 meter descent from the hotel towards the city of Manizales, followed by riding on pavement to Salento. We were cautioned that the ride down was steep and fraught with gravel, so we split up, leaving Erik to ride the GS solo, while I hitched a ride in our support truck. 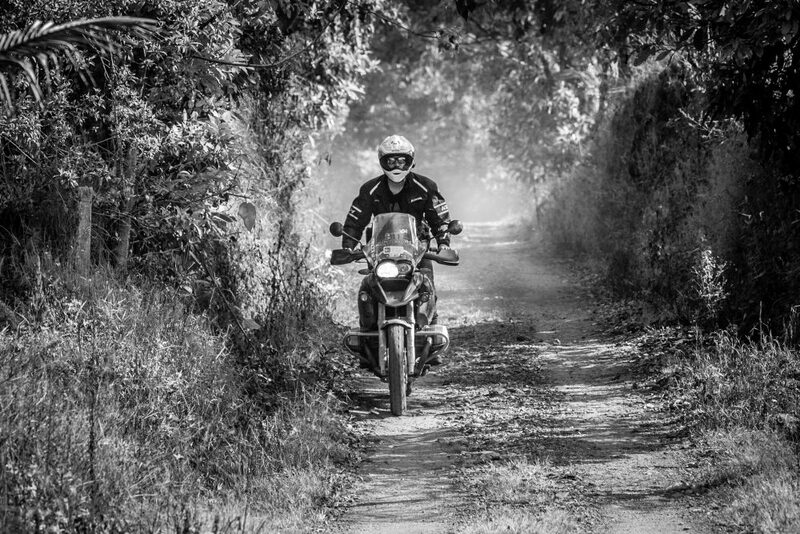 Beyond the narrow width of the road and its multiple blind corners, and a few oncoming vehicles, the descent was some of the most exhilarating fun that he had on the bike. Not to say that he was riding without care, but riding sans passenger was quite a bit of weight off his shoulders (literally and figuratively!). 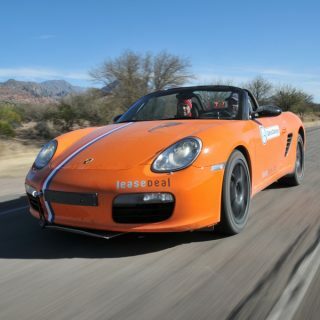 He was almost to the bottom when he noticed an orange alert light blinking along with the steady decline of pressure levels in the rear tire on his dash. 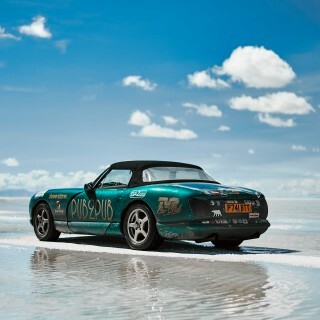 The fact that he had a flat tire sunk in when the hiss became increasingly louder as he slowed to a stop. 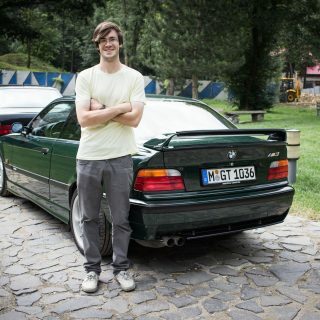 Somewhere along the way, he ended up picking up a 2”-long shard of jagged metal in his tire. Luckily, a caballero on horseback stopped to say hello and inquire about the tire. He gestured that Erik could just ride the bike down to the station in the nearby town for a patch. A tire of the support truck was also punctured rolling over barbed wire , so we all met up at the auto shop to get things patched up. Maybe unsurprisingly, these were not the first nor last flat tires we’d deal with. During the 3 days we’d be on the road, our group would tally a total of 9 flats and 2 of those on the support truck! 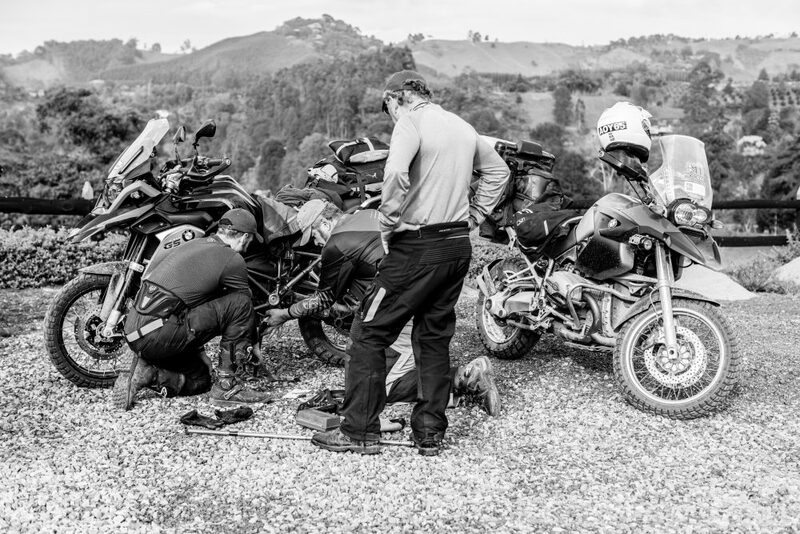 Not long after this pit stop we had to pull off again as another fix was needed when Neil’s tire blew; we were sidelined in Manizales for a bit while we could get the bikes in road ready condition. Our ride to Salento would require less mileage than the day before, and was all on pavement. 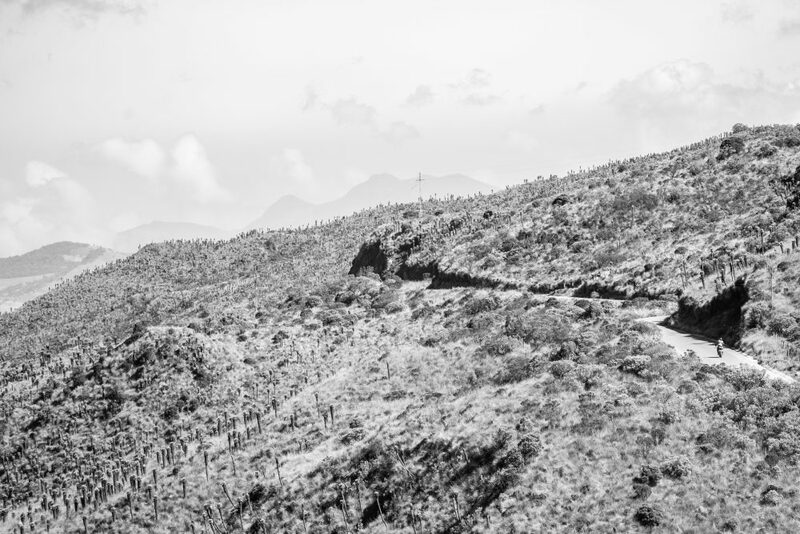 We rode along a main route that was like an endless snake, twisting and turning down towards our destination. These were probably some of the most fun paved roads of the whole trip, and clearly the locals thought so too, as 5 or 6 sports bikes blasted by us, dragging knees as they pivoted into another turn ahead. We arrived to Salento later than we had expected as the afternoon sun was slowly burning out. 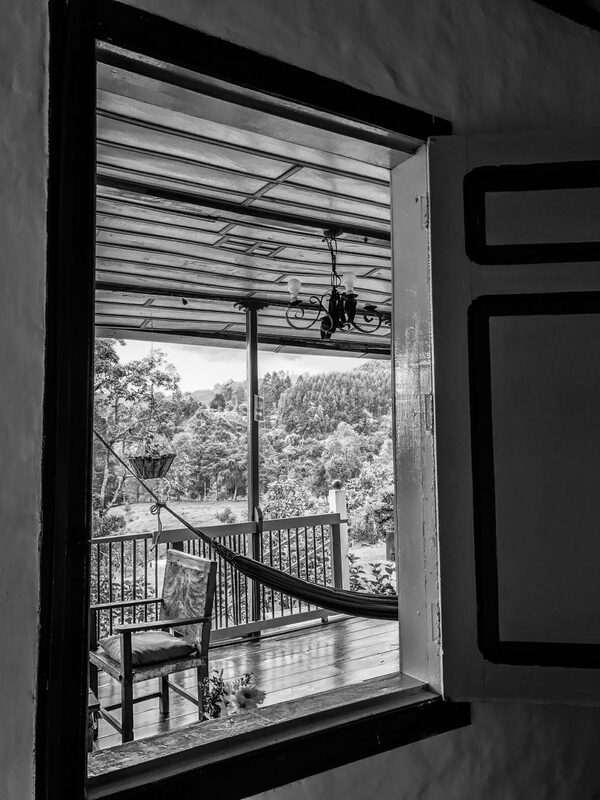 We settled into El Rancho de Salento, a small, peaceful ranch with a bright white, blue ,and yellow exteriors with potted flowers, hammocks, and swings. We could have stayed here for a while, but we didn’t want to miss the area’s main attraction before losing daylight : Valle del Cocoro. Despite wanting nothing more than to pass out for a bit, we grabbed some lunch at the restaurant at the bottom of the road from the ranch and then hopped back on the bikes to ride to the valley. The rest of the crew was too beat, so only 4 of us made it to Cocoro Valley. The sights were stunning. Vibrant green hills were spotted with Colombia’s national tree, the quindío wax palm, growing taller than any palm trees we’d ever seen in our lives. As the sun was slowly descending behind clouds creating silver linings and illuminating the land below, we agreed that this vista was the perfect close to the second day of our journey. The following morning, our final day had arrived and we’d have 300 km and many hours of road time to get all the way back to Bogotá. After a beautiful breakfast at the ranch with fresh fruits, ham and eggs, and local Colombian brew, we snapped a group shot and geared up for the road. A few of us opted out of more off-roading in favor of riding pavement for the remainder of the trip (our asses thanked us), but we would be traveling solo without any guides and traversing Route 40, the legends of which we had no idea of at the time. 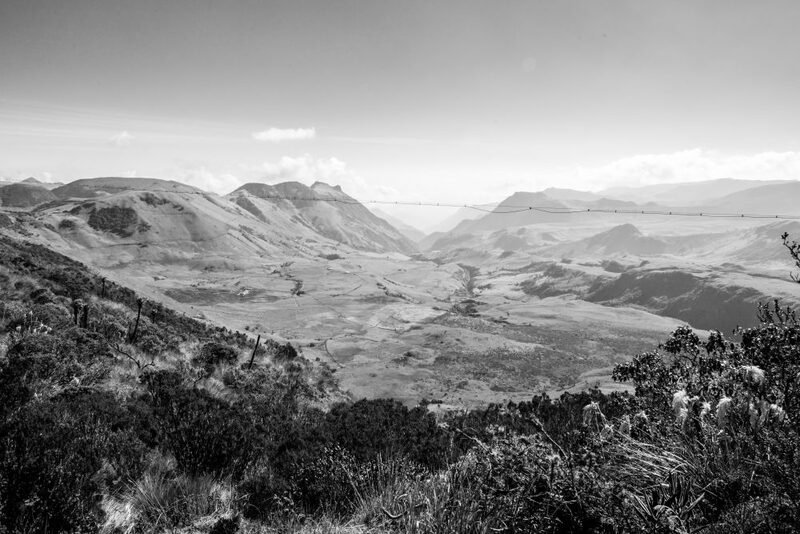 Route 40 stretches from a western port all the way to Bogotá, which forces trucks to make the drive in order to deliver Colombia’s various cargo. 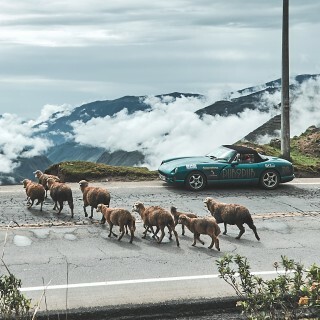 But from Armenia to Ibagué, Route 40 becomes a mountain pass dubbed “La Linea,” as it winds its way up and over the central Andes, featuring the biggest and most angled switchbacks we’d ever seen. 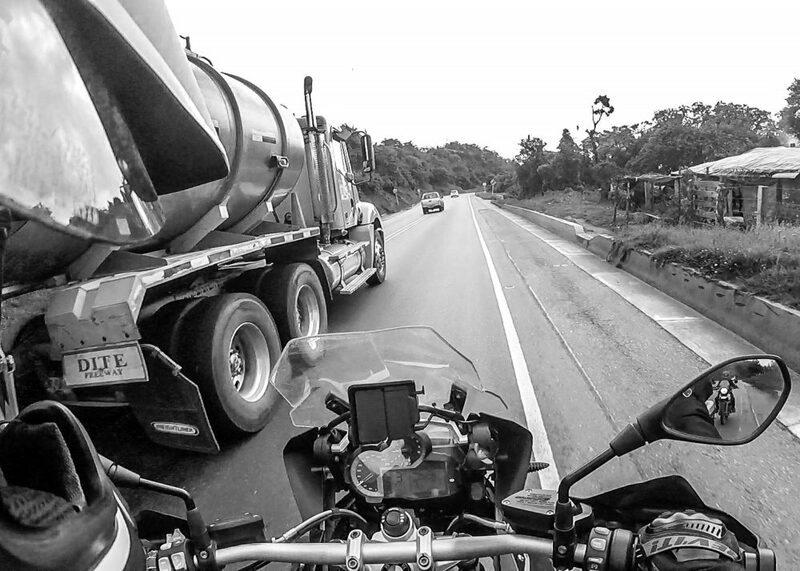 This notorious segment of road has an accident rate 4 times the national average and its dangerous conditions continually threaten motorists as truckers swing their semis wide into oncoming lanes when clear, to avoid using their brakes. Here we were, riding down the mountain, and we were getting passed by 18 wheelers that squeezed us into our lane between their massive tires and the concrete barriers protecting us from the vast drops. We’d see locals standing in the curves, frantically waving motorists on to signal that it was clear to pass and that there was no oncoming traffic. Apparently they do this service in rain or shine and gather the coins tossed to them with gratitude by the drivers. 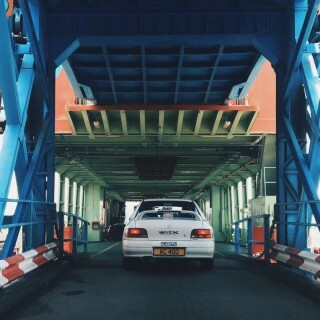 We finally thought we had hit our stride and when we took the lead on the open road. 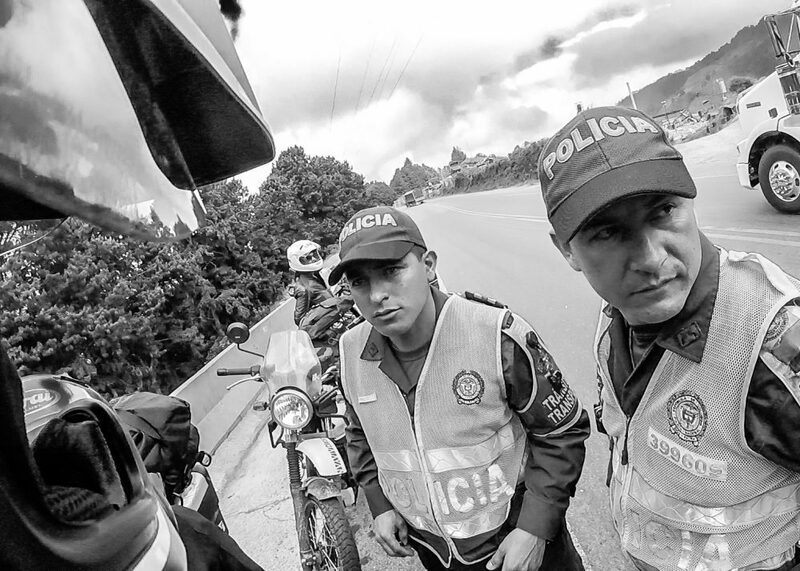 That was until we crested a hill and to our dismay, 20 Colombian police officers blocked the roadway. A checkpoint! They motioned for us to pull over and shut off our 3 bikes. We were approached by a group of 4 officers, 2 of whom spoke to our friends Jen and Adrienne riding behind us, and the others came to speak with us, asking for licenses and papers. Good thing Erik had dusted off his Spanish. He explained why we were traveling through the country, where we had come from and that these bikes were rentals. If anything, they seemed more curious and excited about the bikes. Where did we get them from? How much were the rentals? For how many days? Can I sit on it? Turn it on. Before we knew it, a cop mounted the bike, revving it like crazy, while his buddy laughed and egged him on. 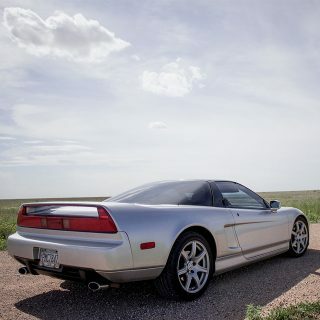 He pulled in the clutch and shifted it into 2nd gear, continuously revving the engine. I could see Erik tense up, worried they’d let the bike lurch and fall. He laughed nervously while pleading, “Espera, espera!”– “Wait! Wait!” as he reached to keep the clutch pulled in and pop the bike back into neutral. The cop barely noticed, an ear to ear grin still on his face. We passed the test and were free to continue on our way, but before we could get back on our bikes, the caravan of cars, busses, and trucks we had worked so hard to pass ended up passing us back before we could lift the kickstand. Sigh, here we go again. If driving off road on mountains, in the dark, amidst thick fog was a white-knuckler, what could you call this? Sure, we were riding during daylight this time, but imagine negotiating endless blind hairpin turns with the craziest and most daring of drivers, all vying for your piece of asphalt. A different brand of white knuckling, if you will. Learning the backstory of La Linea pass put the whole picture together though: we now understood why the truckers drove how they drove. They had to, as the alternative would mean burning up your brakes and becoming a crater at the bottom of the ravine thousands of feet below. Our next stop was in the city of Ibagué, where we’d meet up with the rest of the group for a nice lunch al fresco. They had off-roaded to get there, so they had arrived with faces covered with dust and dirt and smiles. We dined on huge Argentinian steaks and chicken and rice to refuel for the hours of riding left ahead. We’d be traveling together back to Bogotá, right to the very hotel where we had started. 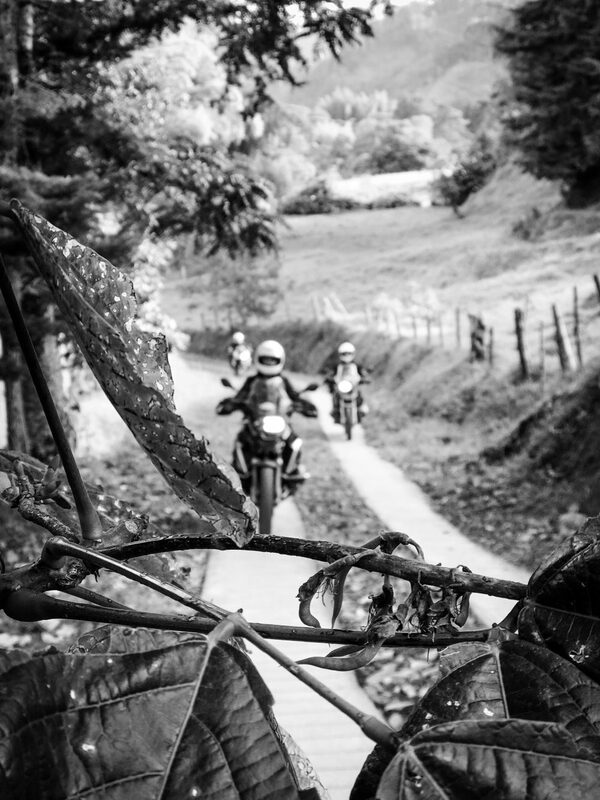 It wasn’t long after our food and gas refuel that we were riding Colombia’s straight highways home. It was the final leg of our journey which had felt many days longer than reality. The thick grey skies overhead warned us that we’d be encountering our first bout of wet weather this whole trip—we had been so lucky thus far to have the shining sun as a consistent companion. We pulled over on the side of the highway briefly to pull on all of our rain gear outer layers, which turned out to be good timing as the skies opened up and huge, heavy raindrops were pulled to the ground. The roads became a bit slick, but the GS1200 could handle it with rain mode and traction control engaged. The closer we got to Bogota, the later and darker it grew. More and more motorists joined us on the road until we realized we were driving on a busy highway getting passed by daring motorcyclists, scooters, and aggressive trucks once again. This was just the way it is here and everyone seemed to adapt fine. It reminded me of Tetris: moving pieces all trying to fit in with that little bit of anxiety that you’ll be quick enough and not mess it up. 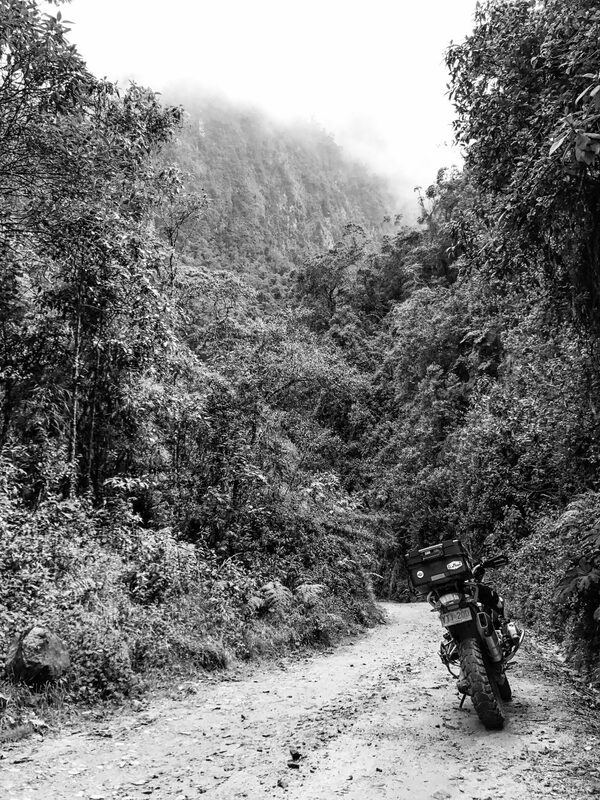 The remaining hours of our moto journey may have been less exciting, but even “less exciting” on Colombia’s scale still seemed to wow us. 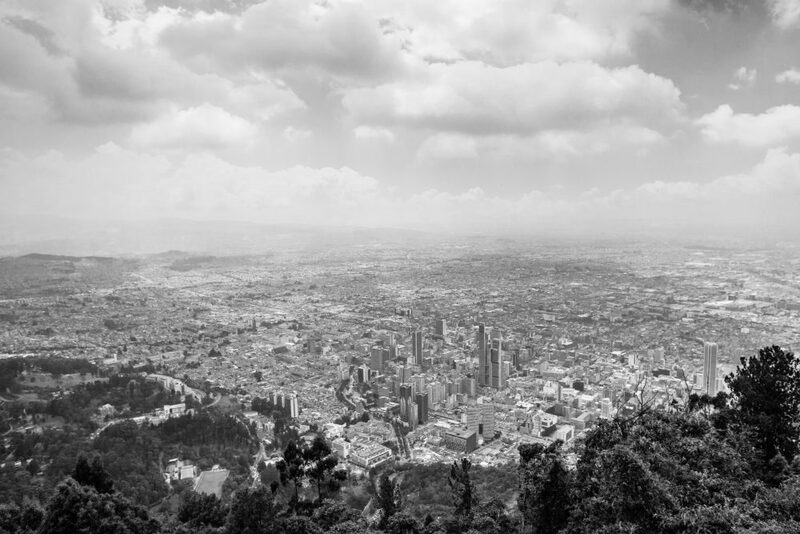 As we began to climb back up to Bogotá’s 8,500 ft, a lightening storm illuminated the night sky in the distance. When we finally arrived in the city, we didn’t so much as celebrate but simply return our vehicles and head straight to the comfort of our hotel rooms. It was the best night’s sleep. On our last day in this culturally rich country, we got to go up to the top of Monserrate via gondola to see the expansive views of this city atop its plateau. At this vantage point, we reflected on everything we had been through, all that we had experienced and seen. The people we had met. The food we tasted. The newness and the unknown. I certainly felt we earned a badge of honor for our adventuring. 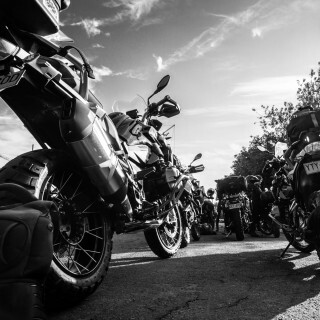 We had never taken a trip like this before; my motorcycling adventures had been previously limited to cruising on our Triumphs up and down the Northern California coastline. Ocean cliff sides with guardrails. This trip was like taking the training wheels off. 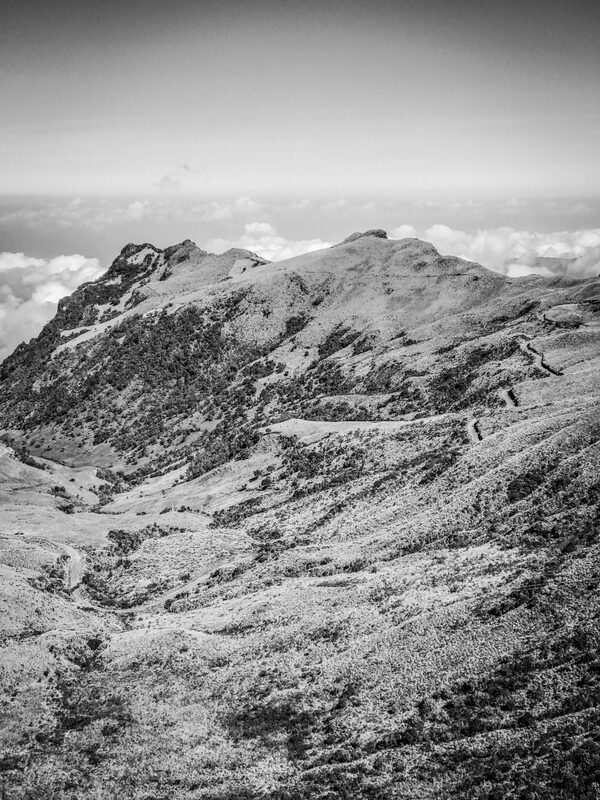 This was some of the most challenging riding we had ever accomplished. We may have been without our guardian bells, but we surely had the Colombian road gods looking out for us. 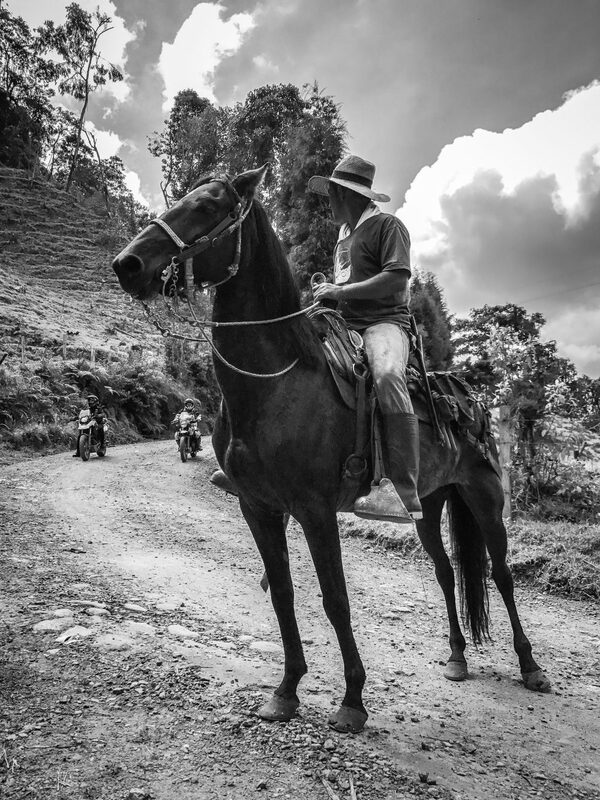 These roads in this foreign land brought us together with the welcoming Colombian people, from Mateo’s family and friends to the roadside caballeros, the welcoming townspeople, and even the policia. 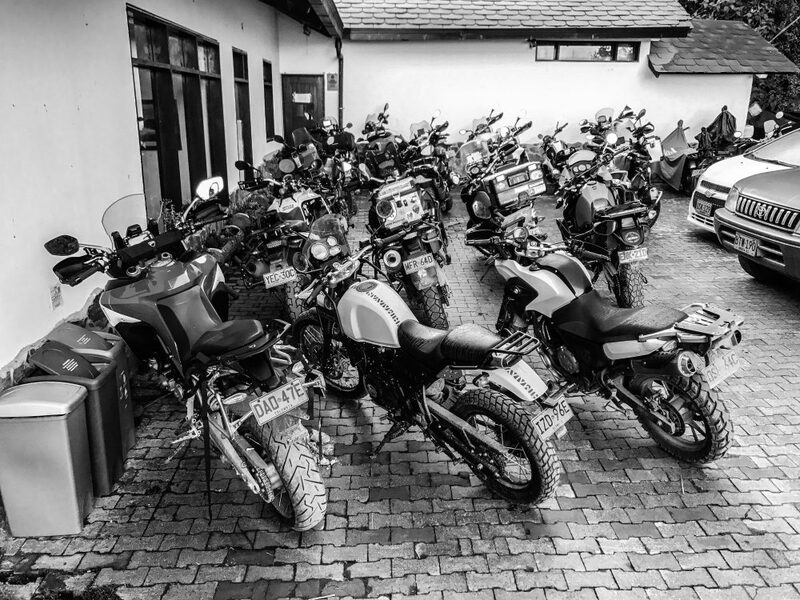 New friends and old, we had come together over the love of motorcycles and all had experienced personal triumphs in one way or another. 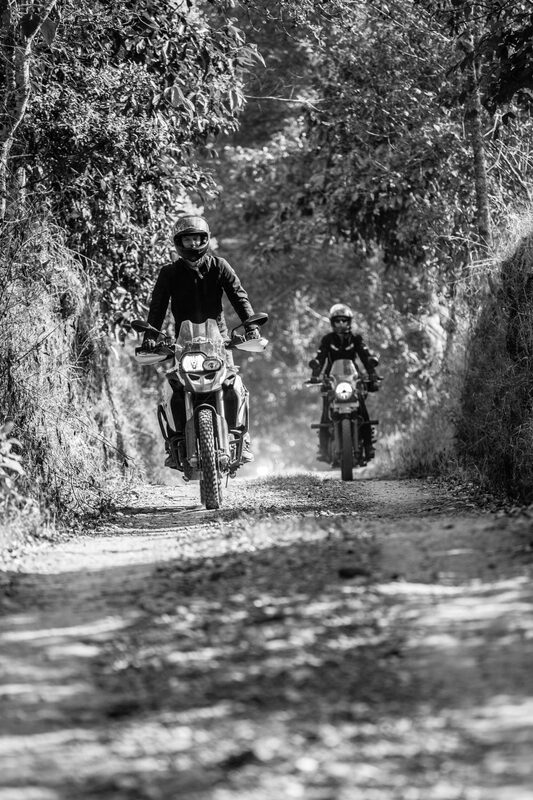 Most of all, we were grateful to see the parts of a countryside we would have never seen if not for the roar of an engine and the power of two wheels. Sarah, congrats again. So well written. Thanks you two for join us at this adventure. Loving the story and especially the B&W photos . But if I may in a moment of minor pedantic correction . Hi Guitar Slinger! Thanks for reading. I was shooting digital on a Canon 5D MKII with a variety of lenses– 50mm 1.2 L, 24mm 2.8, and a 70-200mm 4 L were my go to’s, along with some iPhone 7 plus thrown in there when I didn’t have time to get my rig out for a shot. I contemplated bringing my Hasselblad medium format film camera on the trip, but I was already weighed down enough with all the riding gear and what-not.